Anti-terrorism officers are continuing to question eight men as they investigate an alleged bomb plot. The arrests in south-east England came as detectives seized half a ton of fertiliser, of a type used as explosive in the Bali and Istanbul bombings. The suspects are thought to be at Paddington Green's high-security police station in London, and could be held up to a fortnight under anti-terror laws. Aged from 17 to 32, the men are thought to be UK citizens of Pakistani descent. About 700 officers from five forces carried out searches at 24 addresses early on Tuesday morning, following weeks of surveillance. 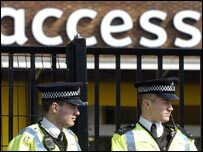 Ammonium nitrate, the fertiliser seized from the lock-up in Boston Road, Hanwell, west London, can be mixed with other chemicals to create a powerful explosive. BBC security correspondent Frank Gardner said the raids followed the infiltration of alleged extremist Islamist groups. He said sources had told him the alleged targets of any bombing were not military or government-related but members of the public. Our correspondent said police believed they had traced the source of the ammonium nitrate but had not revealed the details. He described a mood of "restrained jubilation" among security services who believed they had stopped a plot at an early stage. Head of Scotland Yard's terrorist branch Peter Clarke said warrants were issued under the Terrorism Act 2000. The men are being questioned on suspicion of being involved in the commission, preparation or instigation of acts of terrorism. Two were arrested in Uxbridge, west London, three in Crawley, West Sussex, and one each in Ilford, east London, Slough, Berkshire, and Horley, Surrey. Surrey Police said the 18-year-old man arrested in Horley had been found at a Holiday Inn hotel near Gatwick Airport. 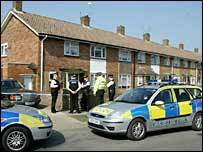 There were also raids at houses and businesses in Colindale, north London, Luton and Reading. Mr Clarke, who is national co-ordinator of terrorist investigations, said premises were still being searched by forensics teams. He assured the Muslim community the police knew the "overwhelming majority are law abiding and completely reject all forms of violence". "We have a responsibility to all communities to investigate suspected terrorist activity," he said. He said the operation was not linked to the bombs in Madrid and there had been no danger to the public. Mr Clarke said: "Today's operation is part of continuing and extensive inquiries by police and the security service into alleged international terrorist activity and I must stress that the threat from terrorism remains very real. The public must remain watchful and alert." Massoud Shadjareh, chairman of the Islamic Human Rights Commission, claimed the Muslim community was being "demonised" as a result of such raids. He said: "These raids are usually given a lot of importance when they are taking place, but when people are released without charge, it is not news. "It is creating a deception in the minds of ordinary people that we have a bigger problem than we really have," he added. Ammonium nitrate was used in the Istanbul bombing last year, the Bali attack in 2002 and is believed to have been used by al-Qaeda in an attack on the US embassy in Nairobi in 1998. It was also used in the Oklahoma bombing in 1995. "The biggest counter-terrorism operation in years"